Sound Transit's technology to enable light rail trains to travel across Lake Washington on the I-90 floating bridge has received a 2017 Best of What's New award from Popular Science. 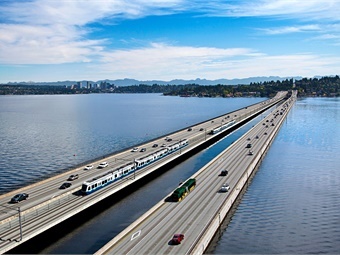 As part of the East Link project, a 14-mile extension of Sound Transit’s light rail system from downtown Seattle to Redmond via I-90, light rail vehicles will travel across the Homer M. Hadley Memorial Bridge over Lake Washington. It will be the first light rail line in the world to operate on a floating bridge. WSP USA led and managed a multidisciplinary team, including the University of Washington and the Transportation Technology Center Inc., to conceive and develop an innovative concept from computer modeling and analysis through detailed design and prototype testing of a “track bridge” technology that will enable light rail vehicles to transition from the fixed to the floating sections of the I-90 bridge. Trains will travel on a 1.1-mile floating span linked via transition spans to concrete box girder approach spans on either end. The structural system is subject to dynamic, multidimensional movement of the bridge deck at the existing expansion joints, due to changing lake elevations, vehicle traffic loading, wind, waves and, for extreme conditions, the breaking of anchor cables, all of which were addressed in the design. Development of the design required the collaboration of a team consisting of track and structural engineers, computer modelers, research specialists and special trackwork fabricators, working with construction experts, to take the project from concept through full-scale prototype testing. The WSP team conceived, developed and demonstrated a novel concept, the Curved Element Supported Rail (CESuRa) system, which works through the interaction of curved and rotating track supports, which automatically adjust for multi-directional movements of the supporting bridge deck. This innovative approach addressed yaw, pitch and roll movements and will provide a smooth alignment and profile under all movement combinations. The track bridge concept was tested by operating two Link light rail vehicles at up to 55 miles per hour across two prototype track bridges at the Transportation Technology Center in Pueblo, Colorado in 2013. East Link is now under construction, with completion expected in 2023.